Unless you’re a seriously dedicated Indian food enthusiast, you probably don’t have a tandoor. But that doesn’t mean you can’t make deliciously tangy, smoky, tandoori-inspired foods on your home grill. Here, F&W’s best ways to approximate incredible tandoori dishes. Unless you’re a seriously dedicated Indian food enthusiast, you probably don’t have a tandoor (an urn-shaped clay vessel somewhere between an oven and a barbecue pit). But that doesn’t mean you can’t make deliciously tangy, smoky, tandoori-inspired foods on your home grill. Here, F&W’s best ways to approximate incredible tandoori dishes. 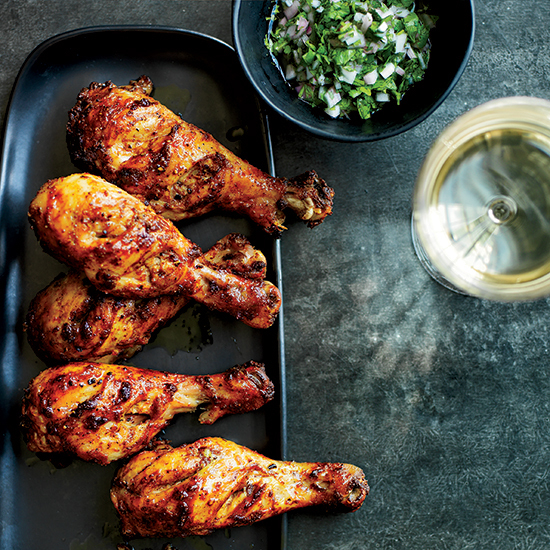 Here, global grilling master Steven Raichlen follows the traditional method of tandoori marinating—a wash of lemon juice followed by a long bath in a yogurt-based marinade—using a tender, succulent leg of lamb. This chicken has the best skin: It’s nicely spiced and super-crispy. Wrap this tender grilled salmon here in naan with cucumber salad and cilantro sprigs for a delicious, healthy sandwich. These grilled quail are seasoned with a super-simple spiced yogurt marinade, which gives them delicious char on the outside and keeps the meat juicy within. Not only is this pork healthy and flavor-packed, it’s also ready in just 30 minutes. These lamb chops are marinated in an ultra-rich yogurt mix enriched with heavy cream. This fish is flavored with tandoori powder, a mix of ground coriander, ground cumin, smoked paprika, turmeric, chili powder, ginger powder, garlic powder and garam masala. Flavored by a yogurt and spice paste with ginger, cumin and corianger, this chicken tastes almost as good as if it were cooked in a tandoor oven. You can make this spectacular seafood dish with either large shrimp or lobster tails. These Indian-inspired stuffed potatoes are filled with mashed potatoes mixed with cabbage, tomato, cashews, cheese and spices.